Ingvar Sodal was born in Norway and raised in a rural farming area in the Trøndelag region near Trondheim, 350 miles north of Oslo. He started dancing in his teens and has been involved with Scandinavian folk dancing nearly all his life. In his early 20s, he became a Certified Folk Dance Teacher in Norway and a member of the National Board of Folk Dancing (Leikrådet). As a certified instructor, Ingvar taught folk dancing at all levels in Norway. He was a member of the Norwegian National Advisory Board for Folk Dancing and Folk Music in Norway for four years, a leader and instructor for exhibition groups in Norway. In 1962, Ingvar moved to Colorado to study at the University of Colorado in Boulder and soon became an active instructor in Scandinavian folk dancing there as an instructor for the Boulder International Folk Dancers. He was the founder and leader of the Boulder Scandinavian Dancers, holding workshops and regularly scheduled teaching sessions. 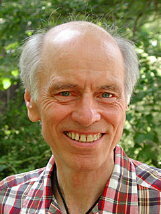 Ingvar has taught at many camps and workshops throughout the United States. Ingvar teaches to recordings produced in Scandinavia by the best folk orchestras the Scandinavian countries have to offer. The company he and his first wife, Jofrid, formed (and which Jofrid now manages), Norsk, Ltd., imports Scandinavian music and books and cross-country ski equipment. Ingvar and Jofrid had a daughter, Silja. Ingvar subseqently wed his current wife, Sally, and the couple resides in Boulder, Colorado. Ingvar is a Colorado Mountain Club (CMC) legend. In the l960's he gave a huge boost to popularizing cross country skiing in Colorado by importing ski touring equipment from Norway, by starting the CMC cross country ski school, and by operating Norsk Ltd. selling cross country ski equipment. He helped to lay out and build many beautiful ski trails and taught many people to cross country ski. He spearheaded the building of the new CMC Arestua or Guinn Mountain Hut. Many skiers and racers can thank Ingvar for his enthusiastic push in promoting a new type of winter pleasure. As many of us know, Ingvar Sodal's role in Boulder's vibrant dance community has been priceless. He was one of the original members of the Village Arts Coalition (VAC), an umbrella organization, established in 1989 that now supports more than thirty dance groups providing insurance and creating dance space. Ingvar initiated the creation of an investor group to purchase the Pearl Street Studio, which has become a permanent home for many local dance groups. After an exhausting and costly search for larger space for the dance community, Ingvar, and a small group of dancers, established the Avalon Ballroom. Finally, the Boulder dance community can enjoy its own large ballroom with a first class dance floor. In his leadership on the VAC Board for many years, the dance community's gratitude to Ingvar is immeasurable. His vision and dedicated involvement in the trials of establishing two facilities for dancing in Boulder have been a shining and remarkable light for all involved. He is the affirmation that commitment and endless volunteer work can be a satisfying challenge that subsequently creates warm social bonds  all starting with the love of dancing and music. Although he has retired from the VAC Board, Ingvar is still a glowing example to all. In 2012, Ingvar was nominated for the Colorado Dance Alliance's "Service to the Field" Dance Award for Individuals. Professionally, Ingvar is a bioengineer. He was a director of the Bioengineering Group at the University of Colorado Medical Center, involved in medical research, spent four years on the faculty of Ohio State University, and had his own company in Boulder making scientific instruments. He has published widely, both folkdance and scientific articles. "Folk Dance in Norway," Balkan Arts Traditions, Vol. III, No. 1, 1977. Ingvar also has authored articles in bioengineering, medical, and other scientific journals. Dances Ingvar has taught include Ålandsflickan, Åttetur, Åttetur med Mylne, Bingsjöpolska, Bodapolska, Doła Masurka, Eikeril, Familje Sekstur, Familjevals, Feiar med Vals, Fyramannadans, Gammalpolska, Hambopolska, Innherredspols, Masurka, Parisarpolka, Polka med Bakmes från Kall, Polska med Bakmes från Kall, Reinlander, Rørospols, Rund Mazurka, Schottis med Bakmes från Kall, Seksmannsril, Snoa, Spillemoendene frå Himmerland (Rheinlander Polka), Sprätt Mazurka, Springleik frå Gudbrandsdal, Stigarn, Stigaren, Stigvals med Bakmes från Kall, To Ting, Vågåspringleik, Vestlandspringar, Vossarull, and West Trøndelag Pols.